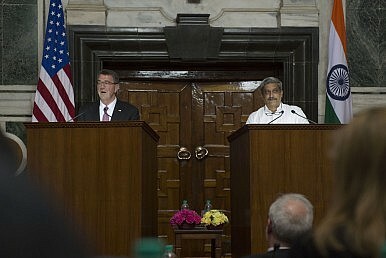 Secretary of Defense Ash Carter makes remarks during a joint press conference with Indian Defense Minister Manohar Parrikar in New Dehli, India, April 12, 2016. New Delhi and Washington pledged to collaborate more closely on defense in a recently issued joint statement. U.S. Defense Secretary Ashton Carter and his Indian counterpart, Defense Minister Manohar Parrikar, pledged to deepen Indo-U.S. military ties in a joint statement issued today. Both senior defense officials envision deeper cooperation in the field of maritime security and military technology in particular. The U.S. defense secretary is currently on an official three-day visit to India on the invitation of the Indian defense minister. Carter is scheduled to depart the country on April 13. Like in previous statements, both sides pledged to expand collaboration on the so-called Defense Technology and Trade Initiative (DTTI) in order to expand Indo-U.S. military industrial ties, and support Indian Prime Minister Narendra Modi’s “Make in India” efforts to bolster India’s indigenous defense industry. In addition, India and the United States welcome “new opportunities to deepen cooperation in maritime security and Maritime Domain Awareness; military-to-military relations; the knowledge partnership in the field of defense; and regional and international security matters of mutual interest.” Among other things, both sides agreed to increase the number of joint military exercises and to step up their complexity. India and the United States will also launch a bilateral Maritime Security Dialogue and commence Navy-to-Navy discussions on submarine safety and anti-submarine warfare. They also pledged to conclude a data sharing agreement on commercial shipping traffic. Under the DTTI, they agreed to two new pathfinder projects on Digital Helmet Mounted Displays and the Joint Biological Tactical Detection System. Carter and Parrikar also emphasized that both countries will deepen consultations and exchanges on aircraft carrier design and operations, and jet engine technology. The agreement would ease the way for regular logistics cooperation, which now occurs on a case-by-case basis.